Above from left to right: John Eardensohn, Senior Principal Engineer and Randi Coopersmith, Senior Principal Planner. Photo by Kristy Walker. Hello, and welcome to a special, 25th Anniversary edition of the Latitude 33 newsletter. This quarter, we are taking an opportunity to highlight a few special stories related to our 25th Anniversary and our core values as a company. We hope you enjoy learning more about our humble beginnings, and how we got to where we are today. Above from left to right: Randi Coopersmith, Senior Principal Planner and John Eardensohn, Senior Principal Engineer. Photo by Kristy Walker. By all accounts, Latitude 33 Planning & Engineering shouldn’t be here today. It should have dissipated before it ever gained momentum. The partners did everything in opposition to conventional business wisdom. They started their firm in the middle of a recession. The firm had few local clients. Moreover, the partners couldn’t pursue some of their best prospects. It wasn’t a promising start. The story of Latitude 33 begins at another large planning, engineering, and surveying firm in San Diego. Randi Coopersmith and John Eardensohn were associates working at the firm together. They watched the company grow from 35 to 125 staff members, and the process was not a smooth one. Convinced they could develop a better business model, they and two others set out on their own, and founded Latitude 33 Planning & Engineering. As junior partners and shareholders, they left with a non-compete clause—they couldn’t pursue any of their former firm’s clients for at least one year. It was 1993, in the middle of a deep recession. The partners began to build their integrated planning and engineering company, and disregarded the standard, single-leader, top-down management model. They genuinely enjoyed doing the work, which lead to a more horizontal structure with hands-on principal involvement. They also wanted an equal partnership with a shared decision-making approach. Each partner owned exactly equal shares of company, and the presidency rotated between the partners. While they each possessed unique skillsets and strengths, they were completely aligned in their goals for growth and the type of culture they wanted to create. For the first three years of the firm’s existence, Latitude 33 didn’t have any local clients. They reached out and found clients in Colorado, Arizona, and Mexico—but not a single client in the State of California. Change came, however, in 1996 when Pardee Homes and Latitude 33 began working together on Pacific Highlands Ranch. The massive, 2,652-acre development led to multiple projects for Latitude 33. 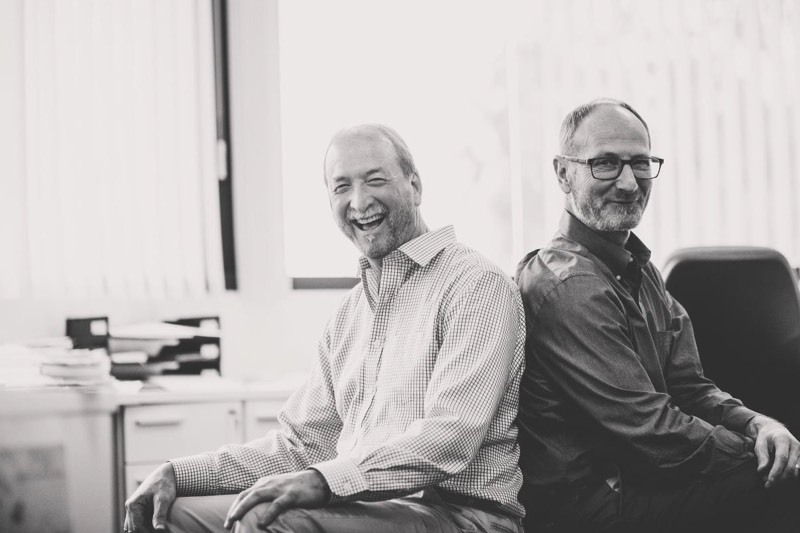 Beginning a snowball effect, the firm then landed numerous local clients, including Gen-Probe, The La Jolla Institute For Allergy and Immunology, and the Eastgate Tech Park. For twenty-five years, the company has gained momentum and forged ahead with great success. The partners each lead a team focused on services including public sector planning, land use planning, public outreach, entitlement services, and civil engineering for public works, private subdivision, healthcare, higher education, and military projects. Diversity – Once known for its niche expertise for coastal projects, Latitude 33 is more diverse than ever. The firm’s clients now include hospitals, municipalities, military, and educational institutions. The firm is reinventing suburbs and urban neighborhoods with projects such as Merge 56. Longevity – Latitude 33 focuses on turning each client into a legacy client. The firm seeks to move past having just “jobs”; instead, it seeks long-term relationships. This requires that the staff be more proactive, anticipate their clients’ needs, and do more than just their jobs. Democracy – Against all business wisdom, a more democratic, horizontal structure has worked for Latitude 33. To this day, every client and every project has hands-on principal involvement. The firm is continuing to build on its strengths, and puts its lessons learned into practice. Using strategic planning, Latitude 33 has been able to grow and thrive. Setting itself up for the long-term, the firm continues to focus on diversification and creating legacy clients in numerous industries. “The challenges of today are less technical and more political,” says Coopersmith. He cites a recent example of The Village at Pacific Highlands Ranch. Going above and beyond, Latitude 33 met with all the stakeholders and garnered their support before the plans went to the City for approval. In the past 25 years, the firm has played a role in having three city-wide voter initiatives approved. “In our 25-year history, we have an unparalleled 100 percent success rate for seeking entitlements,” Coopersmith adds. Latitude 33 Planning & Engineering continues to offer a comprehensive, interdisciplinary approach to design. Serving public agencies, developers and property owners, the firm specializes in residential, education, healthcare, military, commercial/retail, civic, and hospitality projects. And unlike its predicted path at inception, the firm will continue and expand its work, by all forecasts, for many years to come. For more information, visit latitude33.com. The Village at Pacific Highlands Ranch, courtesy Owen McGoldrick. For its first three years in business, Latitude 33 didn’t work on a single project in the State of California. Until Pacific Highlands Ranch. It was the first of many San Diego projects—the one that launched Latitude 33 locally and helped it earn the stellar reputation it has today. Latitude 33 and Pardee Homes, which has developed most of Pacific Highlands Ranch, began working together on the 2,652-acre development in 1996 on an extremely extensive and broad community engagement process. It included input from the Carmel Valley Community Planning Board, community planning groups across the entire city, City of San Diego staff, elected officials, environmental organizations and stakeholders. The developer and design team worked with the surrounding community to create the Pacific Highlands Ranch Subarea Plan, the community plan for this area. The plan was on the forefront of visionary planning in San Diego by preserving and enhancing the existing habitat and canyons system, creating new wildlife corridors, and creating an urban village in a northern San Diego suburb. The Sierra Club, the Endangered Habitat League, the Carmel Valley Community Planning Board, and many other organizations fully supported the plan. The Pacific Highlands Ranch Subarea Plan was adopted by City Council July 28, 1998. Twenty years later, the area has transformed into a vibrant, world-class community with thousands of residents, energy-efficient market-rate and affordable homes, outstanding schools, a multi-trail system, shopping centers, and 1,300 acres of preserved open spaces. And, it’s not done yet. Under construction is the heart of the entire community: The Village at Pacific Highlands Ranch. The Village at Pacific Highlands Ranch will bring commercial retail, high-density residential, civic, and park uses together as the pedestrian-friendly town center for the master-planned community. The multi-use, urban village will include 252 market rate residential condominiums and 79 affordable residential units (331 total units), 195,000 square feet of commercial space, a library, and a civic use area including a dog park, 13-acre public park, access to biking/walking trails, and central plaza with outdoor seating, fireplaces, and a fountain. The Village will provide a place to live, play, socialize, learn, work, shop, and dine, all within a walkable space. Latitude 33 is proud to be part of a major collaborative effort to bring The Village to fruition. This portion of Pacific Highlands Ranch attracted numerous companies to gather around a common goal and purpose to get the master plan designed, approved, constructed and open for use. The team of Latitude 33 Planning & Engineering, SPGA Architecture and Planning, Wiseman & Rohy, McParlane & Associates, Michael Wall Engineering, Inc., MW Peltz + Associates, Inc., and Coast Income Properties, Inc. made this dream project a reality. Additionally, Wermers Construction is the builder of the market rate apartments, and Affirmed Housing developed the affordable component. SGPA was the architect for the commercial components, and Architects Orange designed all residential pieces. More than 20 years after beginning to work on the community, it is very satisfying for the entire Latitude 33 team to continue its work at Pacific Highlands Ranch, and see the vibrant community thriving, in part, because of Latitude 33’s efforts. Latitude 33 in action. Top Row: San Diego Mud Run in 2012 (left). The annual Scripps Ranch Old Pros 4th of July Run (right) and Ride (center). Latitude 33 is an annual sponsor for this race. Bottom Row: 2017 Holiday party (left). Rock climbing in 2017 (center). The superhero-themed Engineers Without Borders Kick Ball Tournament (right). As noted in this edition’s feature story, Latitude 33 values longevity and focuses on building long-term relationships. Relationship-building is not only part of our focus for clients, it is also part of our internal culture, as well. Modeled after Ken Blanchard’s theories about productivity and leadership in the workplace, Latitude 33 strives to create trusting relationships among all team members. Blanchard notes that 45% of employees say that lack of trust in leadership is the biggest issue impacting their work performance. By contrast, high trust organizations experience 32 times greater risk-taking, 11 times more innovation, and six times higher performance. Trusting relationships in the workplace leads to increased collaboration, higher levels of creativity, and more effective execution of business strategy. In honor of Latitude 33’s 25th Anniversary, we look back on some of our favorite moments over the years as we have built a culture of trust and teamwork in the workplace. Enjoy the pictures above! Above: Latitude 33 drone pilots include Allan Ramos and Austin Baber. Bottom left: Altman Clinical and Translational Research Institute. Bottom right: Pacific Highlands Ranch. Hello, and welcome to the fall 2017 edition of the Latitude 33 newsletter. It has been an exciting quarter! Perhaps most exciting is that Latitude 33 recently announced it is now offering drone services to its clients. The aerial images and 3D modeling of a project site can be used during entitlements, site planning, and tracking progress during construction. A highly valuable service, Latitude 33’s drone images can help facilitate interdisciplinary collaboration and improve communication during planning and construction. Images can be captured on cloudy days. The drone operator can work from a considerable distance and not worry about natural or artificial barriers to the sight lines. Images are high resolution and serve a variety of users. They can be transmitted, shared and printed. Software can turn them into topographical maps, bird’s-eye view images, 3D models, point cloud, orthorectified images, and more. Drones present no safety risk for the operator and eliminates risks to ground and air personnel. They are an environmentally friendly option. Battery-operated drones don’t produce toxic fumes. Latitude 33 uses the latest state-of-the-art technology including Agisoft PhotoScan, and all work meets National Map Standards. Please enjoy several other updates in our latest newsletter. Mesa Nueva at UC San Diego opened for fall quarter, beginning September 28, 2017. Mesa Nueva is UC San Diego’s newest housing project north of La Jolla Village Drive and west of Regents Road. The project was opened with a ribbon cutting ceremony on September 27, 2017, in time for graduate and professional students to move in for the start of fall quarter, September 28, 2017. The new development replaced 86 older units which were built nearly 50 years ago. With 1,350 new beds, the residential community is one of the largest graduate and professional student housing facilities in the country. Mesa Nueva features furnished units in studio, 1-, 2-, and 3-bedroom designs. Mesa Nueva was designed to meet the need for housing and provide students with a greater sense of community. Shared amenities include social pool with spas and splash zones, a brew pub, outdoor lounge, a small grocery store, and more. Mesa Nueva is an integral part of UC San Diego’s Long Range Development Plan to house at least 50 percent of eligible students on campus. 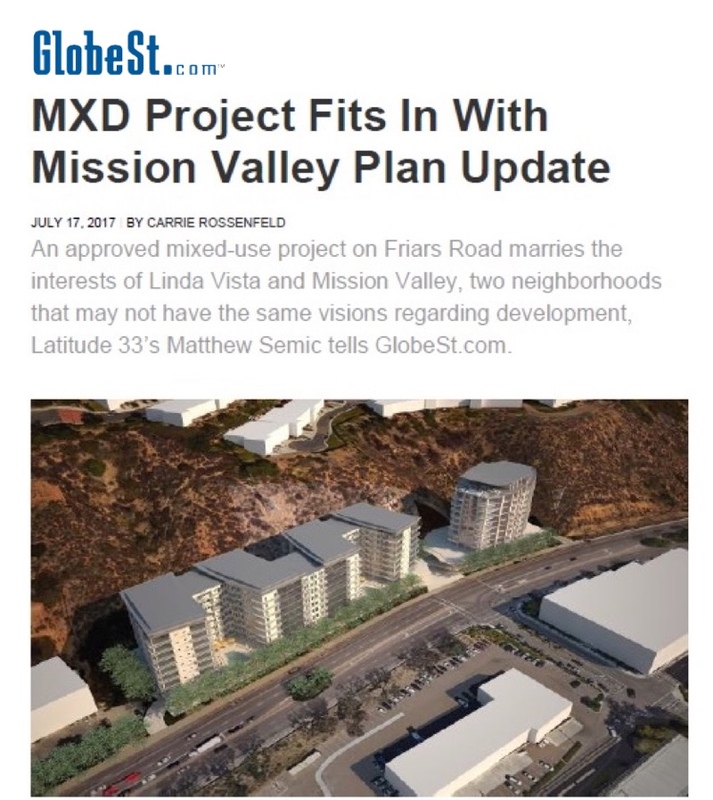 The addition of Mesa Nueva to UC San Diego’s housing options brings the total up to 40 percent, with additional projects underway. The Mesa Nueva Housing community was designed and built with a number sustainable building strategies, aiming to achieve LEED Gold certification. For this project, Latitude 33 provided guidance to the team for an optimum site design solution that addressed all environmental, water quality, and retention concerns. Congratulations to the entire development team on a job well done! Left to right in above photo: Katie Yee, Chief Relationship Officer with Latitude 33; Racquel Vasquez, Mayor for the City of Lemon Grove; Kristal Jabara, Councilmember for the City of San Marcos; Kristin Gaspar, County Supervisor for the San Diego County Board of Supervisors; and Rebecca Jones, Vice Mayor for the City of San Marcos. Over 70 guests enjoyed meeting each elected official, learning about their personal stories, and hearing more about each representative’s unique community. Katie Yee is not only involved with CREW, she is actively involved in the Building Industry Association (BIA), The Urban Land Institute (ULI), and the Downtown San Diego Partnership (DSDP). Above: Paseo de Colachis at the University of San Diego. Below: Latitude 33 team members at the Paseo de Colachis dedication on September 26, 2017. Pictured from left to right are: Justin Listar; Brad Sager; University of San Diego President, James T. Harris III, DEd; Jon Arenz; Katie Yee; and University of San Diego Associate Dean & Professor of Industrial Engineering, Rick Olson, PhD. On Tuesday, September 26, 2017, Latitude 33 attended the dedication for Paseo de Colachis on the campus of the University of San Diego (USD). The new plaza, located near The Immaculate Catholic Church, replaced a two-way street and is part of the school’s plan to make the campus more pedestrian friendly. The new walkway includes a grass lawn named “the Student Commons” and a mini amphitheater. This new green space also includes many sustainability initiatives, including drought tolerant grass and a high-tech watering system that will be used to minimize the amount of water needed to maintain it. Now, the “Most Beautiful Campus in the Nation” (named by the Princeton Review) is even more beautiful. Latitude 33 provided grading and improvement plans to expand USD’s central pedestrian promenade from the existing Colachis Plaza to Plaza de San Diego (approximately 800 linear feet of improvements). Great job, Latitude 33 team! The Altman Clinical and Translational Research Institute (ACTRI) is a new 345,650-square-foot LEED-certified facility, located on UCSD’s East Campus. ACTRI provides infrastructure and support for scientific research throughout San Diego, and expedites the translation of discoveries into therapies. The organization also facilitates the training and education of new researchers. For this project, Latitude 33 provided schematic design, design development, construction documents and construction administration services. An Orchid at the 2017 San Diego Architectural Foundation’s Orchids & Onions Awards. 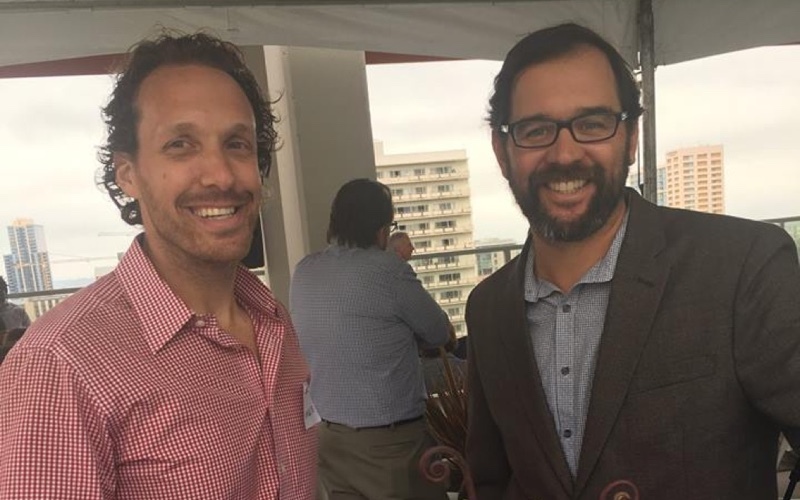 The Orchids & Onions is the only interactive, community-based program geared towards raising awareness and encouraging practical discourse in response to San Diego’s built environment. A Citation Award at the AIA San Diego 2017 Design Awards, which honored thoughtful and innovative design over a broad range of categories. On Saturday, October 14, Latitude 33 participated in the MCRD Boot Camp Challenge, sponsored by the Associated General Contractors (AGC). Boot Camp Challenge offers civilians the opportunity to experience a small taste of Marine Corps boot camp. This race features obstacles used by Marine recruits, with over 60 Marine Corps Drill Instructors staffing the course. Congrats to all participants for surviving boot camp! Thank you for being a part of our planning and engineering family. From the entire Latitude 33 Team, happy Fall! Upcoming: Did you know that Latitude 33 celebrated its 24th year in business? Stay tuned for some exciting announcements and events highlighting our 25th Anniversary in 2018! Hello, and welcome to the summer 2017 edition of the Latitude 33 newsletter. We are excited to report that we have a number of new projects underway! Unitas – A small, five-lot subdivision within the Pacific Highlands Ranch community, this project was unanimously approved by City Council on July 11, 2017. Laterra – Also at Pacific Highlands Ranch, this is a 69-unit, multi-family project which was approved by the Planning Commission on May 25, 2017. Friars Road – Located on a 5.43 acre site, directly across from Fashion Valley Mall and the Fashion Valley Transit Center, this 319-unit project will consist of two buildings with eight and nine stories of residential homes, over two stories of parking and six shopkeeper units. This project received approval from the City of San Diego Planning Commission on April 20, 2017. Pacific Highlands Ranch 8/9 – This project included the rezoning of an entire neighborhood for 515 single family homes, approved by City Council on April 11, 2017. Aperture – This campus-style employment center at Pacific Highlands Ranch, designed by Gensler, includes five commercial buildings at 630,000 square feet. Aperture received substantial conformance approval on February 8, 2017. Our planning staff has over 40 years of experience working on a variety of highly complex projects. We believe in the projects we take on, and we are strong advocates on behalf of our clients. Congratulations to our Planning Department! Below, please enjoy our latest newsletter. Latitude 33 joined the development team for the Center for Novel Therapeutics for the official groundbreaking of UCSD’s Science Research Park on April 11, 2017. Second from the right: Brad Sager, Principal and Jon Arenz, Project Manager. Latitude 33 was excited to attend the groundbreaking for The Center for Novel Therapeutics at UC San Diego on April 11, 2017. The facility, developed by UC San Diego in a public-private partnership with BioMed Realty, will be a new home for university and local research organizations as they work to find treatments and potential cures for cancer and other chronic diseases. 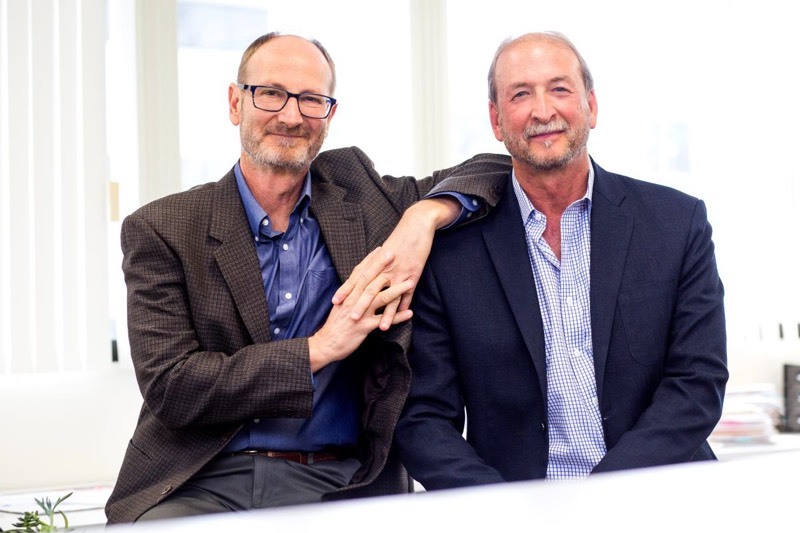 The new Center for Novel Therapeutics will be open to faculty and commercial researchers. It will also serve as a training center for students and post-doctoral fellows in drug discovery, and create shared resources and learning forums for academic and private-sector scientists. The building will consist of 110,000-square-feet of medical office/research space and fulfill an important part of the UCSD master plan for East Campus in UCSD’s Science Research Park. Latitude 33’s services include design/build services with innovative site design and water quality treatment systems to efficiently meet the facility’s LEED requirements. Latitude 33 Principal, Matt Semic, PE (left) with Project Manager, Clay Ost, PE, (right) at the Atmosphere grand opening. On May 31, 2017, Latitude 33 along with Wakeland Housing & Development celebrated the grand opening of Atmosphere. This 31,800-square-foot downtown San Diego project consists of 205 units of affordable apartments, with 51 units set aside as permanent supportive housing for residents who have recently experienced homelessness, and a small commercial component. The project has 12 stories of living spaces with an incorporated green roof, parks, courtyards and three levels of underground parking. Latitude 33 assisted with discretionary permits, construction documents, and parcel maps. At the event, we were honored to have Wakeland Senior Project Manager, Jack Farris, dedicate their plaque to the Latitude 33 team. Congratulations to the entire team for a job well done! Latitude 33 celebrates Shannon Davis’ win of the ASCE San Diego/Imperial Counties Outstanding Younger Engineer Award for 2017. 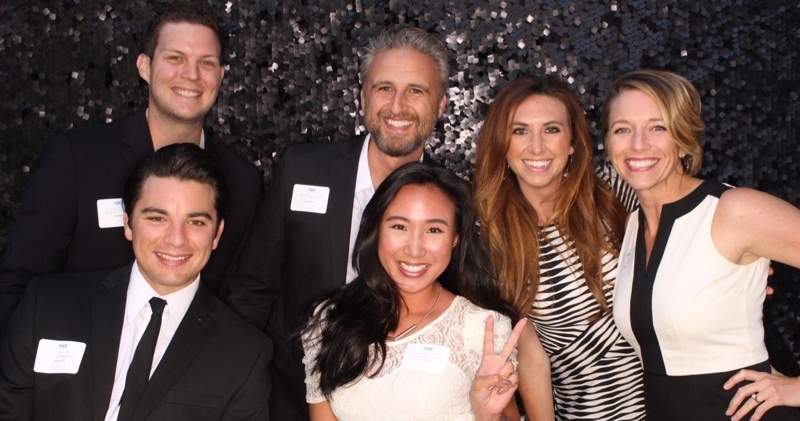 Top Row, left to right: Kyle Boyce; Giovanni Posillico, PE; Shannon Davis; and Katie Yee. Bottom Row, center: Vanessa Tarronas. Latitude 33 is pleased to announce that Senior Project Engineer, Shannon Davis, was recently honored with the American Society of Civil Engineers (ASCE) San Diego/Imperial Counties Outstanding Younger Engineer Award for 2017. Shannon is an integral part of the Latitude 33 Planning and Engineering team as both an engineer, a team leader, and an enthusiastic supporter of our company culture. In addition to all she does at Latitude 33, Shannon has become a role-model for young women considering or pursuing an engineering career. Through Shannon’s involvement in ASCE and Engineers Without Borders (EWB), Shannon has served as a mentor and leader to encourage and support students in engineering. As the EWB San Diego Student Liaison for UCSD/USD/SDSU, she has taken on a leadership role where she can actively work with students to provide hands-on mentorship, resume advice, career counseling, and advocacy. As a leader with EWB’s San Diego Chapter, Shannon is also using her profession to make a difference on an international scale. She seeks to use her expertise to help meet basic human needs and help communities across the globe thrive. Shannon not only contributes to the engineering profession by mentoring the future leaders in her field, she also believes her profession can contribute much in addressing the challenges faced across the world today. Congratulations, Shannon, for this well-deserved honor! TThe Latitude 33 team at their paintball tournament. 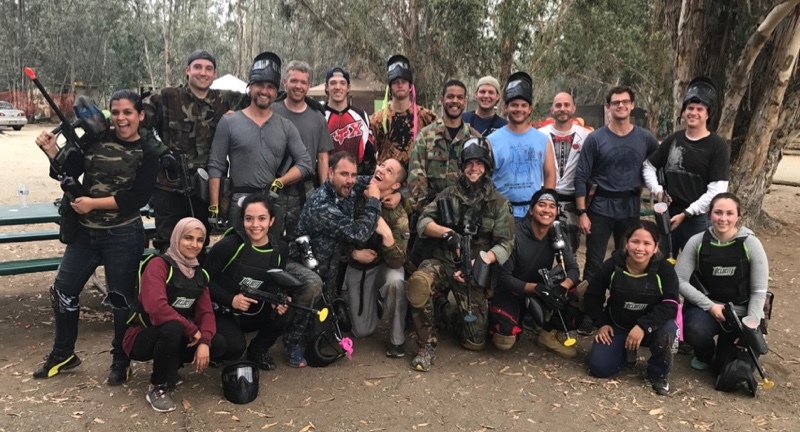 On Friday, May 5, Latitude 33 hosted a team building event by bonding over a couple games of paintball at Velocity Paintball Park. Nothing says team building like shooting at your coworkers! Thanks to all for joining our fun event! 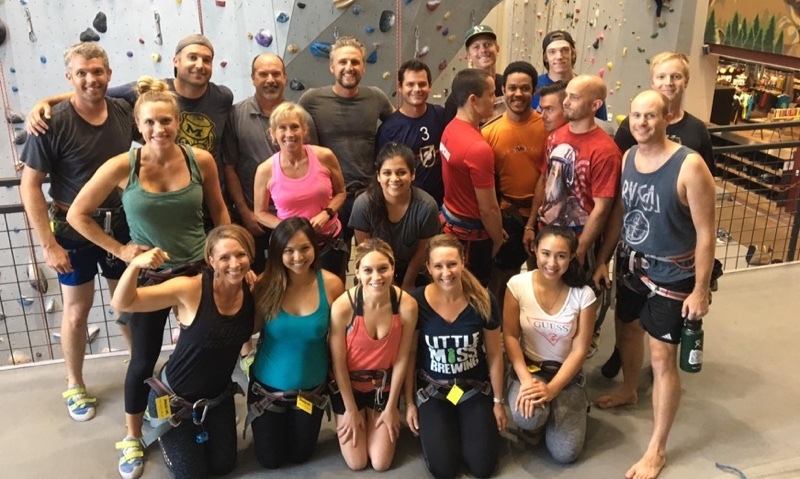 The Latitude 33 team gearing up for rock climbing. Facing fears, increasing trust and improving communication were all underlying themes of our latest team building event on July 21. Latitude 33 headed out to Mesa Rim for a team building event climbing, scrambling, and clawing their way together up the climbing walls. Working together inside and outside of the office keeps our team strong and unified! Latitude 33 Planning and Engineering is thriving and we are starting 2013 with exciting news and business opportunities! We finished 2012 very strong with a growth of 20% over the previous year. Latitude 33 is positioned with a more diverse client base and project workload than ever before! We have found that maintaining a diverse client base, good working relationships with clients we choose to work with has been key to our success and staying strong through difficult financial and economic times. Other exciting news in Latitude 33 includes a recent well deserved promotion of Matt Semic, along with a couple of our recently awarded contract, and project news on the Village at PHR. Latitude 33 Planning and Engineering is pleased to announce the promotion of Matt Semic from Sr. Project Manager to Associate. Matt is a registered civil engineer with over ten years of experience in land development, public works and construction. Matt is proficient in site design, land use, permitting and plan preparation at all stages of a project; agency standards, utility studies, estimating, construction services and project closeout. His representative projects include the recently LEED Platinum and Gold Certified San Diego County Operations Center (Institutional); The San Diego Union Tribune (Infill / Mixed-Use); La Jolla Centre III (Office); Broadstone (Infill / Residential); and Temecula Creek Inn (Resort Community / Golf). The University of San Diego (USD) Betty and Bob Beyster Institute for Nursing Research, Advanced Practice, and Simulation Building is located adjacent to the existing Hahn School of Nursing and Health Science Building on the USD campus. This project includes a three-story, 25,000 square foot building, on a approximate 0.5-acre site. The new building will double the school’s research and teaching facilities. The one of a kind institute for nursing research will be transformative for the school. Latitude 33 is assisting the Client in providing the following services: Conceptual Design, Schematic Design, Design Development, Construction Drawings, Bid Support, and Construction Administration. Latitude 33 Planning and Engineering will be working on the much anticipated expansion of the Colachis Pedestrian Mall. This project will feature landscaped walkways, open lawns, lines of trees, fountains and seating areas. The project is located at the intersection of Alcala Parkway/Marian Way and includes the areas between the north side of Marian Way (i.e. Copley Library, Camino Hall, and Founders Hall) to the south side of Marian Way (i.e. Olin Hall, Manchester Executive Conference Center, and Hahn School of Nursing and Health Sciences). Latitude 33 will be providing preliminary and final engineering services to design and permit the Colachis Pedestrian Mall and Phase 5A of the water main improvements. The Village at Pacific Highlands Ranch was Entitled in 2010. The Village was recently acquired by Coast Income Properties. The project will include mixed-use residential, retail and commercial, a transit center, civic use area, and public library site. The pedestrian oriented development is the focal point of the award-winning Pacific Highlands Ranch subarea. Currently the project in going through extensive review which includes involvement from the community. As we begin the second quarter of 2013 Latitude 33 Planning and Engineering continues to make strides with exciting news and business opportunities. We are pleased to announce additions in both our planning and engineering departments. Latitude 33 would like to welcome Tara Lake, who recently joined our team as a Senior Planner-Project Manager. Tara has over 13 years of experience in plan development, park planning, transportation planning, transportation demand management, urban design, landscape architecture, capital projects, redevelopment, long-range planning, CEQA, development review, and community facilitation. She previously served as a Senior Planner at The Centre City Development Corporation and as an Associate Planner at the City of San Diego. Tara has a Master of Landscape Architecture from North Carolina State University (1999) and a Bachelor of Arts in Urban Studies and Planning from the University of California in San Diego (1994). Tara takes pride in outstanding performance and incubation of creative ideas. Tara will be leading our firm’s urban design and public sector planning projects. Latitude 33 is pleased to have Tara become a member of our outstanding planning department. We are excited to announce that Brad Sager has joined our firm as Associate Engineer. Brad brings over 23 years of professional experience in civil engineering, working with a wide range of projects and multi-disciplinary teams, as well as having handled various critical and challenging projects from design to the implementation stage. Brad has extensive experience designing and managing single family and multi-family residential projects, design build projects and public works and redevelopment projects. His strength is bringing together a team of internal and external professionals to produce a quality product using effective communication and responsiveness. Other Recent Hires for 2013!!! Latitude 33 provided civil engineering services for the $13.8 million stadium renovation, which included creating an iconic entry plaza in the 16th Century Spanish Renaissance style that connects the ballpark with the existing architecture on campus. Five levels of the ballpark were created to incorporate necessary programmatic elements – an entry level with plaza space, a suite and press level, the main concourse, the Torero Zone and the team clubhouse. The updated venue also includes a renovated playing field, new home and visitor dugouts and renovated batting and practice tunnels. In addition, Fowler Park will debut a new, 6,800 square foot team clubhouse that includes reception, coaches offices, a player locker room, equipment room, lounge space and a training room, providing major league amenities to Torero players.